One of the most exciting episodes of last season was “A Glitch Is A Glitch,” which saw the show’s creative team giving complete control to a single artistic voice for a unique chapter in Adventure Time’s history. David O’Reilly’s glitchy computer animation didn’t make for the most coherent episode, but it sure was cool to look at, and “Food Chain” is another visual feast with a bizarre storyline. Written, directed, and storyboared by Masaaki Yuasa, this week’s episode is considerably simpler than O’Reilly’s, but it’s still very weird thanks to the highly stylized direction. From the opening moment, it’s clear that “Food Chain” is going to be different. Showing an orange triangle child as it runs through a food chain obstacle course, the first shot is a close-up of the child’s back as it moves forward, putting the viewer in the kid’s position at the start of a wild ride. It’s not the kind of angle this show typically uses, and it gives the episode a distinct energy that builds over 10 minutes. One of the big things that stands out about “Food Chain” is the shading on the characters, which makes them look more three-dimensional. Everything on this show tends to be rendered in a very flat style, so that extra definition makes a considerable difference. Yuasa also uses a thinner line for his characters and environments, which makes for smoother animation. This is easily one of the show’s most fluid episodes, and the visual impact is amplified by Yuasa’s bright color palette. Set at a museum of natural history filled with kids that aren’t interested in learning, “Food Chain” is about finding ways to make teaching fun. 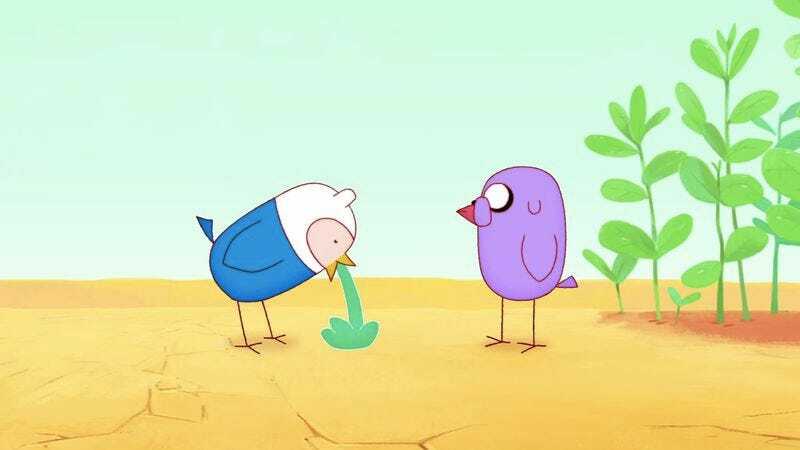 Finn doesn’t understand why he needs to learn about eating caterpillars, so Magic Man decides to show him by transforming Finn and Jake into animals on different links of the food chain. They become little birds that gorge on caterpillars, and then Finn becomes a big bird that wants to eat his little bird bro. That form eventually dies and is eaten by bacteria that turn it into the soil that a plant grows from, and that plant is eaten by caterpillars, starting the whole cycle over again. Yuasa has a lot of fun with the sound in this episode, from the effects (using the sound of a diving bomber plane for a hungry big bird is a very Looney Tunes approach) to the music, which combines chiptune with Mozart, bagpipes, and psychedelic rock and roll. When Finn and Jake are transformed into little birds, they sing “The Queen of the Night Aria” from The Magic Flute against a chiptune backing track; the animation becomes choppy when the song starts jumping around the scale, a clever way of visualizing the music. 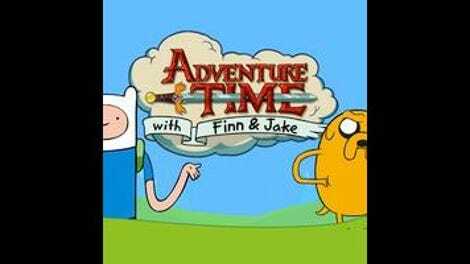 The episode’s trippiest sequence occurs when Finn and Jake become plants after a brief stint as flesh-eating bacteria, and they sing a heavily auto-tuned melody as the background flashes through hallucinogenic visuals. It’s impressive how much mileage Yuasa gets out of this central idea, both visually and musically. In a brilliant creative decision, Yuasa ends the episode at the beginning with that behind-the-back shot of the orange triangle child running into the obstacle course, creating a cyclical episode for a cyclical concept. I love when Adventure Time brings on idiosyncratic artists to put their stamp on this world, and “Food Chain” shows how this extraordinary world can turn a standard science lesson into an engaging sensory experience. It’s extremely out there and doesn’t offer much substance in terms of plot, but Yuasa plays with sights and sounds in ways that make this an unforgettable installment of this series. This episode reminds me of the sequence in Disney’s The Sword And The Stone where Arthur and Merlin are transformed into different animals, with Jake taking on Merlin’s role as someone who is completely comfortable with each shift while Finn is Arthur, struggling to adjust to each new body. Finn gets married to a caterpillar named Erin in this episode. I wonder if that will ever come up again. Is everyone aware that series writer Kent Osborne is writing a Banana Guard comic book miniseries starring Root Beer Guy? He’ll be expanding the police force with familiar faces from the Candy Kingdom, which sounds like a pretty sweet idea. “Yo, Princess Bubblegum! Do birds play football?” I want an entire episode about this candy child because he is hilarious. “Have you noticed we are birds now?” John DiMaggio’s delivery is excellent this week. His inflection makes everything sound translated, which is a fun way of switching up the rhythm of Jake’s speech for an episode.